Movie audiences got their first look at DC’s super-villain team in 2016’s Suicide Squad. 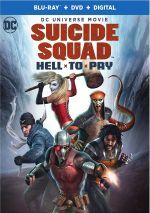 The baddies come back with 2018’s direct-to-video animated tale Suicide Squad: Hell to Pay. Penitentiary warden Amanda Waller (voiced by Vanessa Williams) formed “Task Force X” as a coalition of super-powered criminals meant to take on missions with suicidal potential. She gets the gang together when a mystery man called “Steel Maxum” (Greg Grunberg) steals a mystical, powerful card. With marksman Deadshot (Christian Slater) in charge, the team goes in search of Maxum. This leads them to Branson, Missouri and a series of violent adventures as they pursue their goal. Among this disc’s bonus materials, we find a featurette about plot devices, MacGuffins and red herrings. That’s an appropriate subject, as the essential plot of Pay - the pursuit of the card – really exists as nothing more than a gimmick to motivate action. Happily, this works pretty well, as Pay delivers a fun adventure even without a strong narrative at its heart. Some superhero tales need concrete story/character development more than others, and in this case, light ‘n’ loose works just fine. 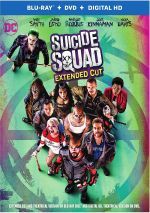 Like many, I viewed the theatrical Suicide Squad as a missed opportunity. It took a lot of exciting characters and stuck them in a muddled effort without the thrills it needed. While I won’t call it a classic, Pay manages to fix a lot of the problems that befell Squad, mainly because it feels like a more coherent affair. Despite the movie’s lack of dynamic plot, it still comes across as a story that progresses in a fairly logical manner, one that takes us from A to B to C well and keeps us with the narrative. It helps that Pay comes with a good array of action beats. The film uses its various characters in a successful manner that capitalizes on their strengths and manages to let them function in a lively manner. All of this comes in a package that keeps us interested in the story points it boasts and tosses out some clever humor as well. Pay turns into one of the better of DC’s animated adventures. 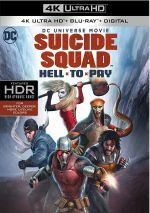 Suicide Squad: Hell to Pay appears in an aspect ratio of approximately 1.78:1 on this Blu-ray Disc. I felt consistently pleased with this strong presentation. In terms of colors, Pay went with a dark palette that favored browns, blues and reds. The tones looked solid, as they showed positive richness and vivacity. I thought the DTS-HD MA 5.1 soundtrack of Pay opened up the comic book material nicely. This wasn’t a particularly ambitious piece, but it added pizzazz to the program. These instances mainly occurred during bigger action scenes. The back speakers brought out a nice sense of space and environment. As we shift to extras, we open with an audio commentary from executive producer James Tucker and writer Alan Burnett. Both sit together for this running, screen-specific look at story and characters, cast and performances, art and animation, and connected areas. Tucker and Burnett provide a wholly ordinary commentary. They touch on a decent array of topics but don’t bring us a particularly engaging or informative piece, so don’t expect a lot from this chat. We get three “Sneak Peeks”, the first of which examines The Death of Superman. In this seven-minute, six-second promo, we hear from Tucker, co-director Jake Castorena and voice director Wes Gleason. They cover story/characters as well as cast and performances. It’s not an unpleasant advertisement, but it’s an ad nonetheless. A Sneak Peek at Superman/Batman: Public Enemies fills seven minutes, 48 seconds and provides notes from DC Comics Senior VP/Creative Affairs Gregory Noveck, casting director Andrea Romano, executive producer Bruce Timm, script writer Stan Berkowitz, director Sam Liu, and actors Tim Daly, Kevin Conroy, Xander Berkeley, LeVar Burton, John C. McGinley and Clancy Brown. They tell us a little about the production and performances, but mostly they just tell us about the story and how great it’ll be. This program remains nothing more than promotional material. Finally, the “sneak peek” for Batman: Assault on Arkham runs seven minutes, 29 seconds and offers info from Tucker, Romano, co-director Jay Oliva, screenwriter Heath Corson, and actors Troy Baker and Matthew Gray Gubler. We learn about the film’s story/characters as well as cast and various production elements. It’s another promotional piece, of course, but it’s more interesting than most. Three Hell to Pay-related featurettes follow, and we launch with Outback Rogue. It goes for five minutes, 14 seconds and delivers info from Tucker and DC Entertainment VP Ames Kirshen. They give us basics about the Captain Boomerang character. We find a reasonably useful synopsis. With The Greatest Marksman in the DCU, we get a five-minute, 36-second reel that includes comments from Kirshen and Tucker. They discuss Deadshot in a program that provides another serviceable character overview. Lastly, The Power of Plot Devices takes up 10 minutes, 30 seconds and features Kirshen, Tucker, director San Liu, DC Animation Creative Director Mike Carlin, and Hero’S Journey author Phil Cousineau. They examine the cinematic use of these concepts: “red herring”, “MacGuffin” and “plot device”. This winds up as a pretty nice little examination of those topics. Under From the DC Comics Vault, we get two shows: “Instinct” from Beware the Batman (22:04) and “Terrors” from Young Justice (22:39). “Instinct” connects to Hell to Pay because both use the Professor Pyg character, whereas “Terrors” links via the presence of Killer Frost, Amanda Waller and Belle Reve prison. Neither episode delights, but they seem entertaining enough. The disc opens with ads for Deep Blue Sea 2 and Batman Ninja. After the disappointment of 2016’s live-action Suicide Squad, I feared the animated tale Hell to Pay would fizzle. Happily, it delivers a brisk, spunky adventure that keeps us pretty entertained from start to finish. The Blu-ray brings very good picture along with reasonably positive audio and a mostly useful array of supplements. DC fans should enjoy this well-executed effort.